Back in 1956 Andy Warhol's paintings belonged in the trash... at least that's what curators of the Museum of Modern Art (MoMa) probably thought at the time. 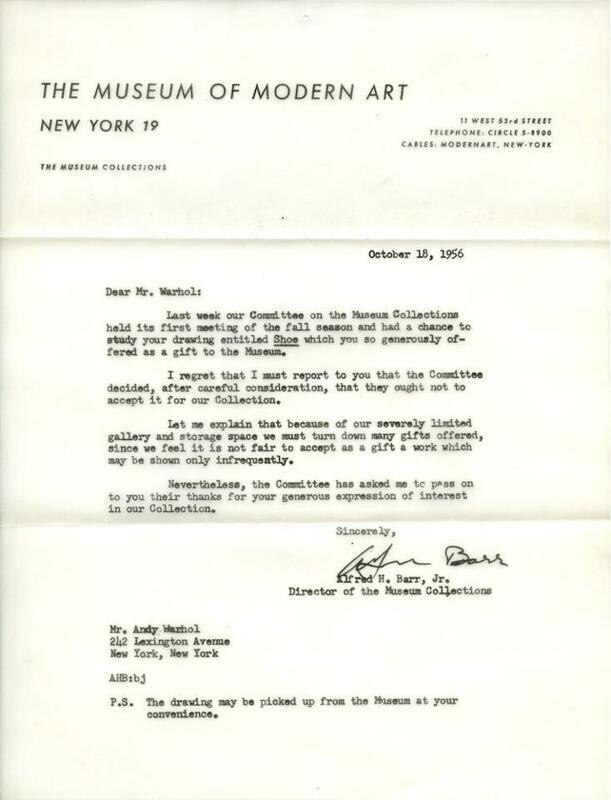 After Warhol donated a painting entitled "Shoe" to the museum, they sent him the above rejection letter. But guess who got the last laugh? Today, Andy Warhol's paintings are some of the most recognizable in the world. In 2008, his piece entitled "Eight Elvises" commanded an astounding $100 million dollars at auction. I'm sharing Andy Warhol's rejection letter not because it's anything new (the letter was actually released in a book in 2009), but rather because it can serve as inspiration for so many of us. While Warhol struggled for acceptance in the art world it's quite likely that he received more than one rejection along the way. So many of us are in that same boat, and we quit pursuing our passions, naively thinking we aren't good enough. Instead, we need to heed Warhol's lessons. Whether you are a high school student, 20 years into your career or simply someone trying to make a life change, keep going... keep pushing... keep applying... keep persisting... keep creating. You may be on the cusp of something huge. What are your thoughts on this letter? Are there any challenging projects that you are currently working on? Do you have any stories to share? Leave your comments below. lol...the post script is the best/worst. talk about adding insult to injury. sheesh. thanks for sharing. it gives us little people hope right? haaa I know! Thanks for reading... and it definitely gives us hope. I really love that you posted this. I hate failure but its a necessary part of life.